The holidays are a time to give, but with unemployment still too high and wages stagnating, it's looking like a tough year for charities. 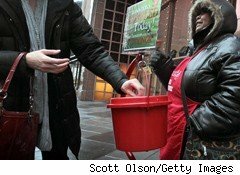 In a recent study, almost 70% of respondents said they will donate less money in 2011 than in 2010, and experts estimate that it may be years before charity revenues return to their pre-recession levels. But just because money is tight doesn't mean you have to give up on giving: Several new programs and companies are making it possible to be generous without opening your wallet. In fact, some charities may even help you save money while you're giving it to others. For example, Gazelle.com helps its customers dispose of old cell phones and electronic gadgets safely, while also giving money to their favorite charities. Rather than tossing out their older tech tools, users can simply send them to Gazelle -- which will resell or recycle them -- and indicate which charity should get the proceeds. Other options make it easier to combine gift shopping and charitable giving. GoodShop.com, a shopping portal that connects users to more than 2,500 stores, donates a small portion of each transaction to a charity or school. Users can choose from a list of over 103,000 charities and schools, and can find out exactly how much money each of their transactions generates. For example, Kindle Fire e-readers on GoodShop are selling for $199, the same price that Amazon (AMZN) is charging. But by buying the Fire on GoodShop, users can give 1.5% -- about $3 -- to their favorite charity. While the 1.5% Kindle Fire donation is somewhat helpful, it's less than half the average donation percentage that the site generates. CEO Scott Garell notes that GoodShop can get retailers to offer these deals because it brings them sellers: "A retailer, like Target, gives us a commission because we're giving them a new customer that they otherwise wouldn't have had. We pass on the commission to the charity, minus a small administrative fee." In the case of the Kindle Fire, for example, the retailers offering the donation are RadioShack (RSH) and Office Depot (ODP) -- stores that rank below Amazon when it comes to top choices for Kindle buyers. In a similar vein, the company has also launched a dining site, GoodDining, where users can donate part of their restaurant checks to their preferred charities. Users register their credit cards, then eat at any of the company's network of 10,000 restaurants. When they pay, 6% of their dinner check will be funneled to their favorite charity. For GoodShop, GoodDining and GoodSearch -- their online search program -- the goal is to make giving as easy as possible. "We want to give people the power to change the world through everyday actions," Garell says. On the other end, recipients get access to a much larger community of givers. "There are no opportunity costs with Good," notes Nick Hutchinson, chief development officer of Juma Ventures, a charitable organization dedicated to helping underprivileged young people get college educations, and one of GoodSearch's partners. "They put us in touch with people and funds that we wouldn't have gotten otherwise." While the individual donations generated through Good and Gazelle may be small, they add up: Hutchinson notes that, in the seven months Juma has been working with Good, it has received several thousand dollars through the relationship. For the rest of us, these new services can painlessly transform some of our ordinary holiday expenses into donations that will make someone else's holiday a little bit merrier.